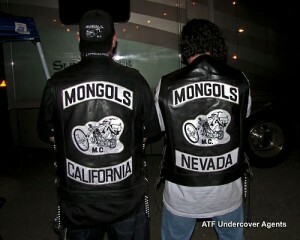 A Number of Mongols Motorcycle Gang Members Involved in Murders and Drug Trafficking Plead Guilty in Calif. This was a nasty gang that did it all, including murder. Good to know some of these guys won’t be seeing a motorcycle for a while. LOS ANGELES –A number of Mongols motorcycle gang members have pleaded guilty to charges stemming from an indictment that accused them of drug trafficking, murder and other offenses, prosecutors said. The revelation came in court documents filed earlier this month by prosecutors, who asked a judge to seal all plea agreements in the case against 79 defendants. Thom Mrozek, a spokesman for the U.S. attorney’s office, declined Tuesday to say how many people have pleaded guilty and to what charges. In October, law enforcement agents served more than 100 arrest warrants in six states after infiltrating the Mongols biker gang, which is based in Southern California and had about 600 members. A racketeering indictment described a tightly organized criminal organization that engaged in murder, torture and drug trafficking to achieve its goals. The indictment said the group, which is mostly Latino, attacked black people, committed robberies and stole motorcycles. The gang funded itself in part by stealing credit card account information, prosecutors said. Posted: 5/27/09 at 12:53 AM under News Story.